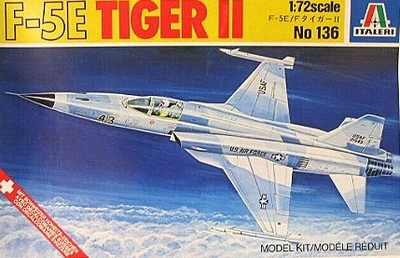 Many years ago I purchased the Italeri kit #136 of the F-5E Tiger II. It looks good in shape and dimensions. The kit has raised panellines but under a camouflage paint they look still good. (more photos below for the similar newer release). The cockpit has a nice seat but the stick #4 is shown incorrectly and reversed in the instructions. The rear bulkhead behind the seat is better opened up so this was done with a razor saw and knife. The intakes #10 and #11 are a bit undeep, opening up the holes on the fuselage side fairings can be done, but I painted the area black at the rear. Sometimes antennas can be added: often an antenna panel sits atop of the vertical tail on real F-5E's, and an antenna on the spine. Also a probe on the lower nose side is missing. ECM fairings on nose and rear fuselage are also in the kit but not always installed. So check photos for the model you want. The lower speed brakes can be set open and drooped down, add a few actuators in that case. The exhausts #31 are a bit undeep, if desired they can be opened up an deepened with some scrap parts. The Italeri kit was assembled as per instructions but with some smaller changes as described above. The cockpit as also already detailed. This Brazillian F-5EM aircraft has a dorsal fin/ fillet and a tank boom. The dorsal fillet was now to be added. The lower corner was sanded flat and a fillet made from thin card and with some white glue faired in. 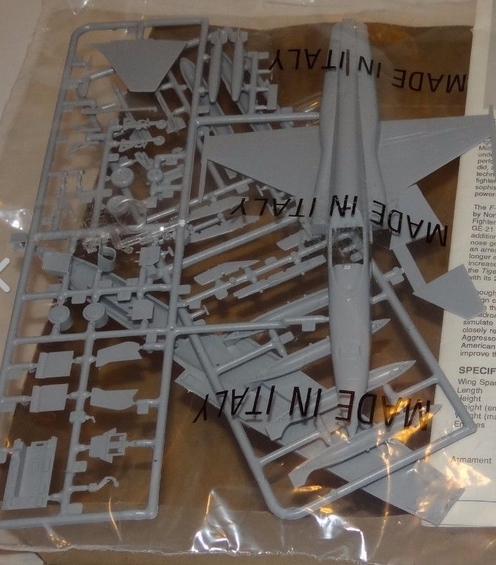 The tank boom came from an ESCI F-5A of the "Soshi tiger" kit #9038 (to be built later). The model does not require the ECM parts (#37 and 38). The exhaust area was also airbrushed after masking in aluminium but the exhaust pipes got a bit darker paint. Decals were applied on the model with a gloss undercoat with my usual technique. 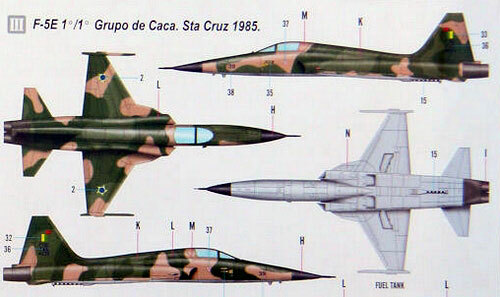 These decals are very thin and no Brazil national markings are on the lower wing surfaces. 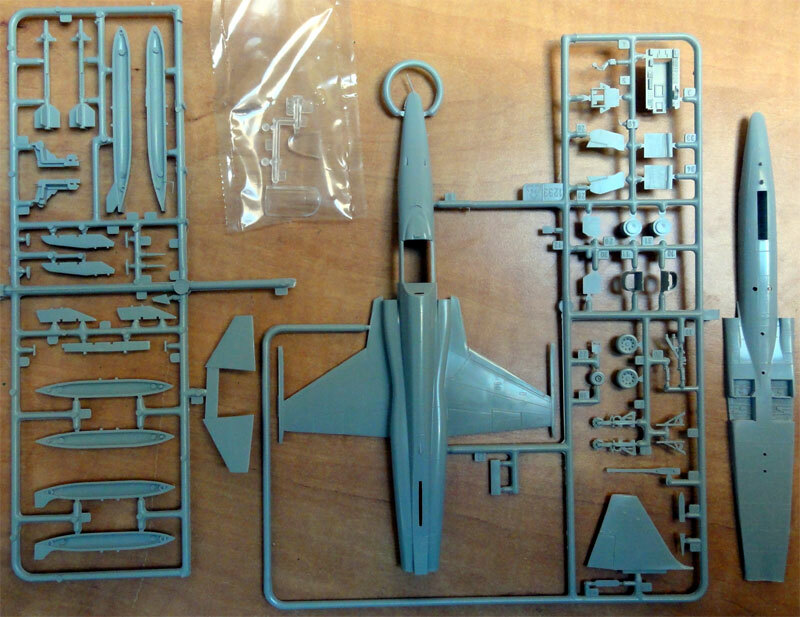 The F-5E canopy is good but has no detail inside and this is missing when set open. 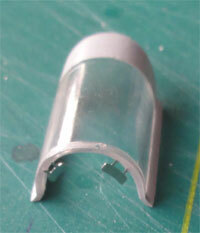 In the kit is a rather crude small part #12 to install it open. First I added a piece of card in the rear section of the canopy. On the kit seat, two small rods were set in place. This will suggest the mechanism. Inside the front canopy frame I added 2 tiny mirrors from etched metal. These came from a REHEAT mirrorset. The insides of frames were painted medium grey. The canopy can be set open when fixed with tiny drops of superglue. 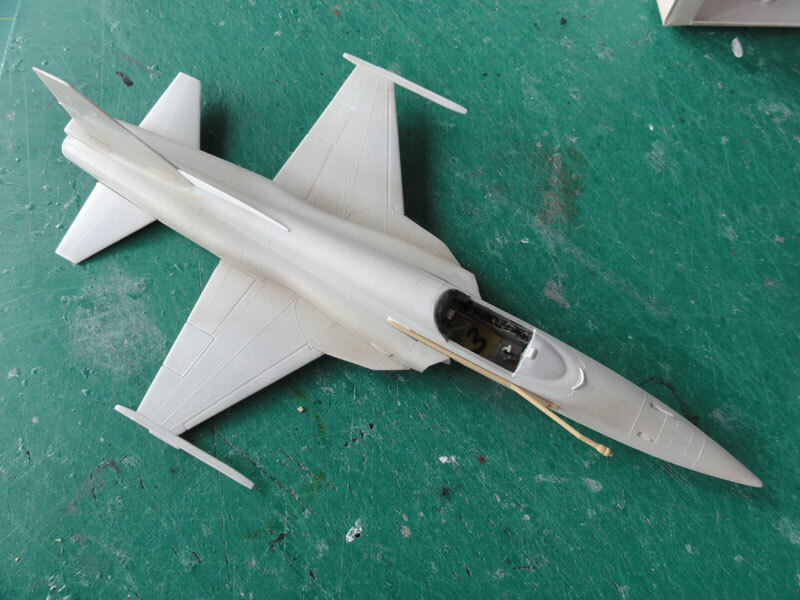 The F-5E end finishing was also to replace the nose pitot with a bit of a metal needle and adding a few hydraulic lines from thin wire to the undercarriage gear legs. On the arrestor hook part black stripes were painted. As this aircraft has a tank probe of starboard side, the rather standard angle of attack vane/indicator below the windscreen on starboard (right) side is not seen. So do not install kit part #49. But a small sensing probe was added on the port lower side next to the nose gear bay made from a metal piece of rod. 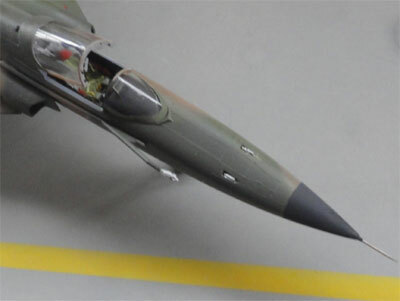 A large UHF antenna on the fuselage spine is often seen on Brazilean F-5E's with also a tiny black antenna in front of that and aft of the canopy; these were made from card and rod. After all dried, a semi-matt dull coat was applied with Future with 5% Tamiya flat base mixed in. This gives an even sheen and looks good as well as protecting the decals for years to come. Finally, the canopy installed after it got 2 mirrors. The Brazilian air force ("Forca Aerea Brasileira") FAB was established in 1941 but the Military aviation started much earlier in 1915 with French biplanes and Saulniers. 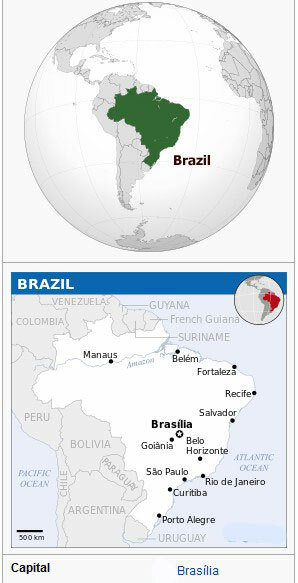 During the Second World War a Brazilian unit was fighting in Italy as part of the Allied forces. Also, some German U-botes were sunk off the Brazilian coast. After the Second World War, the first jets were the British Gloster Meteors and later US supplied jets like the Lockheed F-80 and T-33. Also, in the fifties Fokker S-11 trainer aircraft were ordered and manufactured under local license. In 1961 there came a democratic but left government and in 1964 there was a military coup. 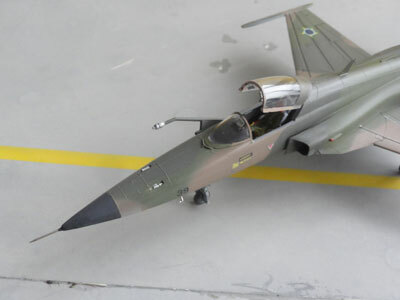 From 1967 Brazil was allowed to buy Northrop F-5 fighters but in stead Mirage 5 aircraft were purchased and further developed into the Mirage F-103 as well as quite some Aermacchi MB-326's. 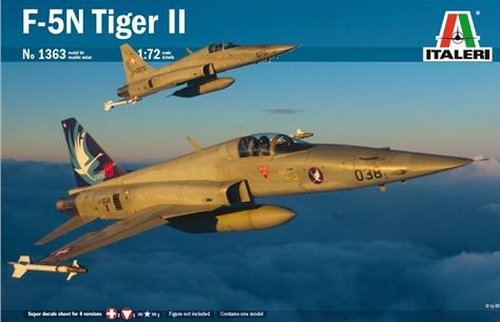 In 1974 again a deal was made and Brazil became the first customer for the newer generation Tiger: some 26 F-5E with the dorsal antenna but also some 6 older F-5B to be used as trainers. Locally an new aircraft company started known as EMBRAER and manufactured the Brazilian version of the MB-326, the Xavante. In 1988-1989 additional refurbished ex-USAF 17 F-5E and 3 F-5F were acquired under the "Peace Amazon II" program. Most were operated from Sta. Cruz. 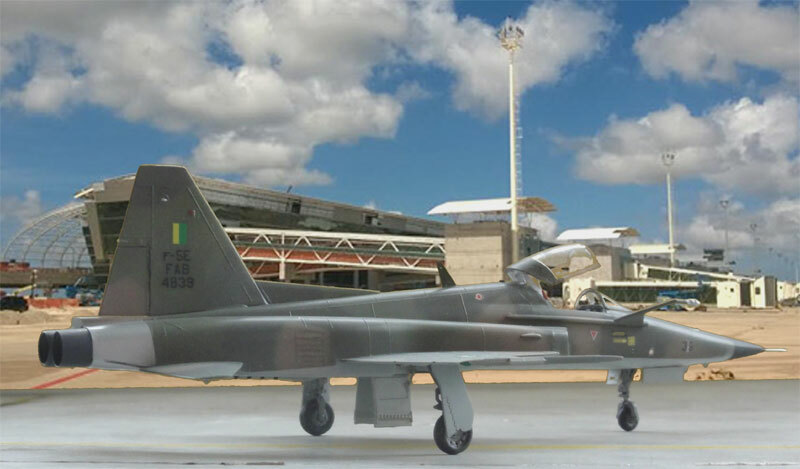 Meanwhile EMBRAER also developed types like the Tucano advanced trainer, AMX attack aircraft and smaller transport aircraft (including civilian types like Bandeirante, Xingu and Brasilia). During the years the F-5E aircraft have been modernized such as with refuelling boom and avionics and systems. 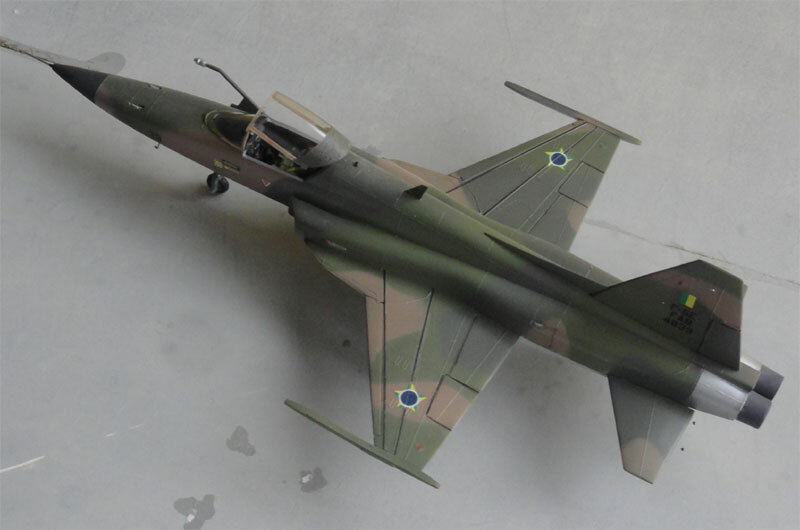 From 2001 Elbit and EMBRAER got a contract to upgrade some 46 F-5E and F-5F aircraft with also a larger nose cone for the radar and other systems like HOTAS, LCD screens and much more. They are designated F-5EM and F-5FM. 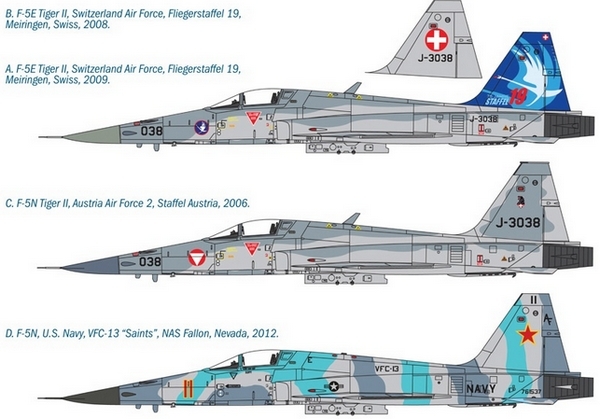 In 2009 some 3 ex-Jordanian F-5F aircraft were acquired and these were also modernized. A dozen Mirage 2000 fighters were purchased as well second hand from France and in service from 2006-2013. Plans are, after long discussions and debating, to have some 36 Saab Gripens (or even Gripen NG) in the Brazilian air force in the future. Currently it is the largest air force after the USA forces on the American continent. F-5EM of Grupo de Casa 1/1, Sta. Cruz (year 1985). This is still seen as to the original standard as delivered. Seen here at a base in Natal, North Brasil. 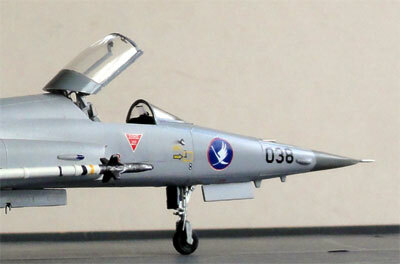 The kit of Italeri has also been released as a F-5E/N as kit #1363. The F-5N is a version with improved avionics and systems of the F-5E but externally very similar. 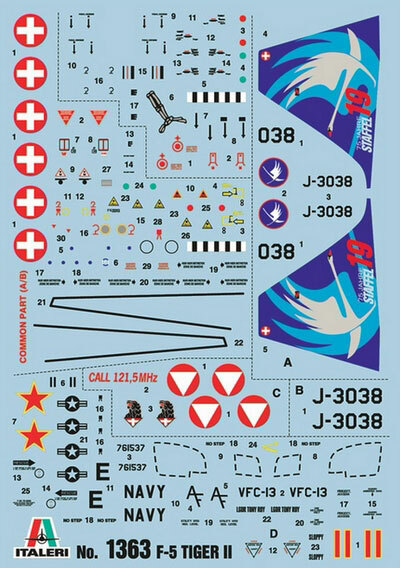 This kit has been released in a number of different boxes like #1333 for a Patrouille de Swiss F-5E. 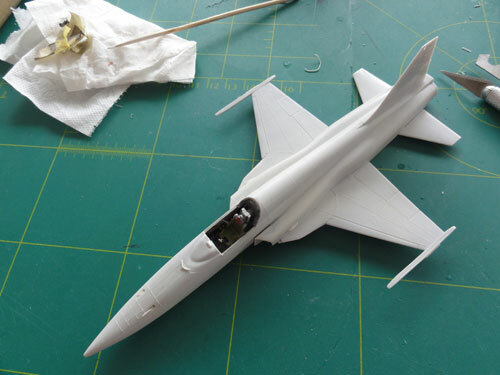 A modification has been made on the kit parts for the fuselage nose: the kit got moulded in the shark like wider nose of later Tigers. 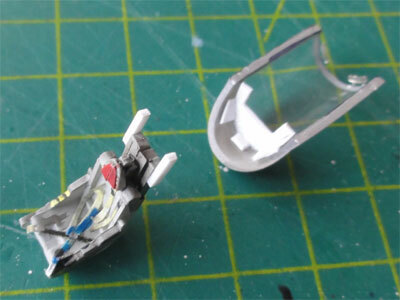 This is seen below in the photo with the "protecting" ring sprue around the shark nose. (1) a Swiss F-5E of Fliegerstaffel 19 at Meiringen with a nice swan on the tail. (2) F-5N of Austria Staffel 2. (3) F-5N of US NAVY VFC-13 "Saints" based at Fallon NAS Nevada in 2012. The kit was simply made mostly out of the box but only adding some details. 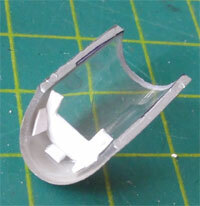 The ECM fairing parts in the kit on nose #37 and tail #38 were applicable for the Swiss machine so fitted. 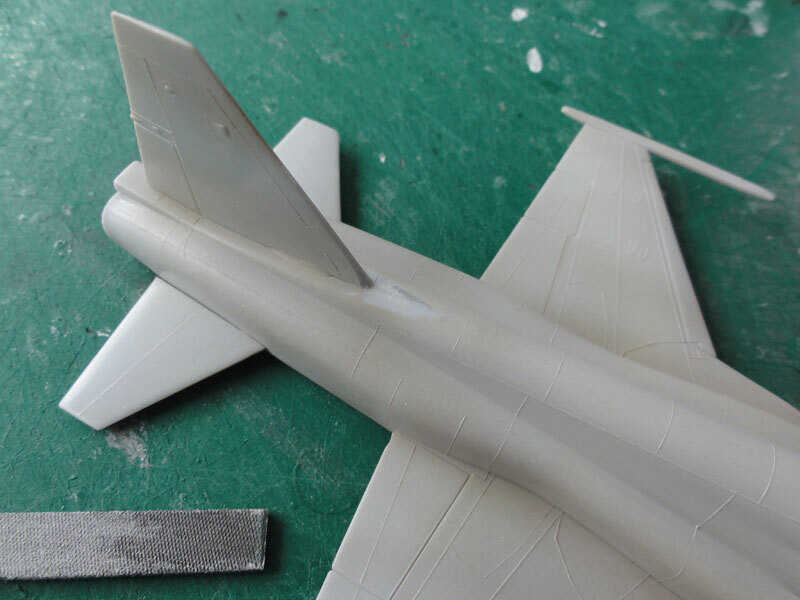 The lower and upper fuselages sides need some putty and sanding at the mating surfaces. Panellines are than lost, so can be rescribed here. 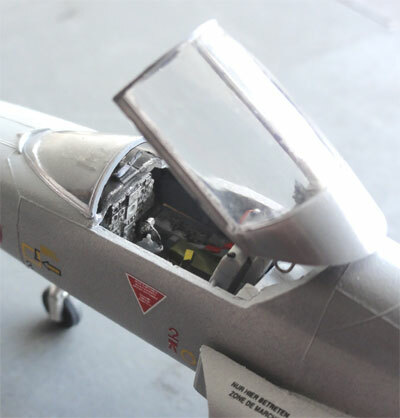 The cockpit got extra detail with a scrap canopy hinge mechanism. 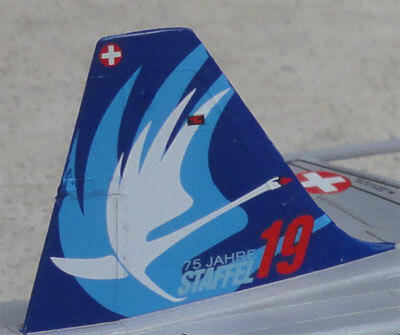 I opted to use the very nice Swiss decals in the kit with the "Swan on the tail". That was the reason I bought it kit, a very good price to model proposition. After assembly a base grey coat (using Revell Aqua 75 "steingrau" acrylic) was applied and showed some extra sanding was needed at the nose sides. The nose got a slightly darker grey colour and the rear fuselage areas an aluminium rear end. The decals were applied over a gloss varnish undersurface and the kit decals are VERY nice! The walkways were also added. The tail looks great! The edges were painted blue. 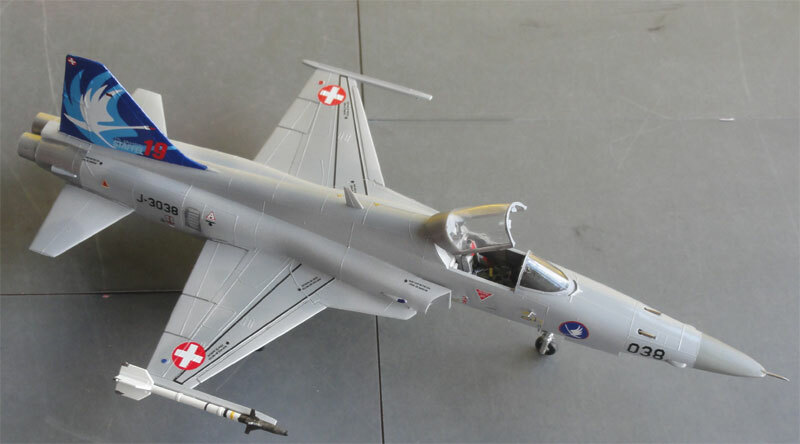 Most Swiss F-5E aircraft are seen without pylons, so the model was kept "clean" with no pylons. But a single Sidewinder was added to the right wing tip launch rail. The Sidewinder AIM-9L/M was obtained from a Hasegawa Weapon set III as the kit part is inaccurate and also seems an AIM-9J. 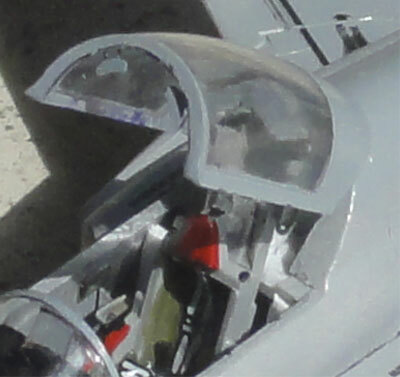 The standard angle of attack vane/indicator below the windscreen on starboard (right) side was installed using kit part #49. Also a small sensing probe was added on the port lower side next to ehe nose gear bay made from a metal piece of rod. 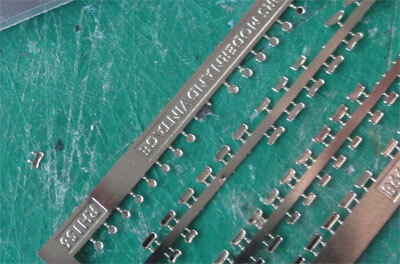 The gun barrels were made from bits of metal needle as well as the nose pitot. Final finish was a semi-dull varnish coat applied with the Harder Steenbeck airbrush as described above.. 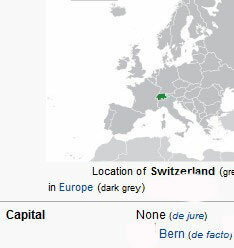 The Swiss air force was established in 1914 as part of the army and has used quite a few different types despite the neutral position of Switzerland. In 1936 it became an independent air force. During the Cold War, it only used British supplied aircraft like the Vampire, Venom and some Hawker Hunters. 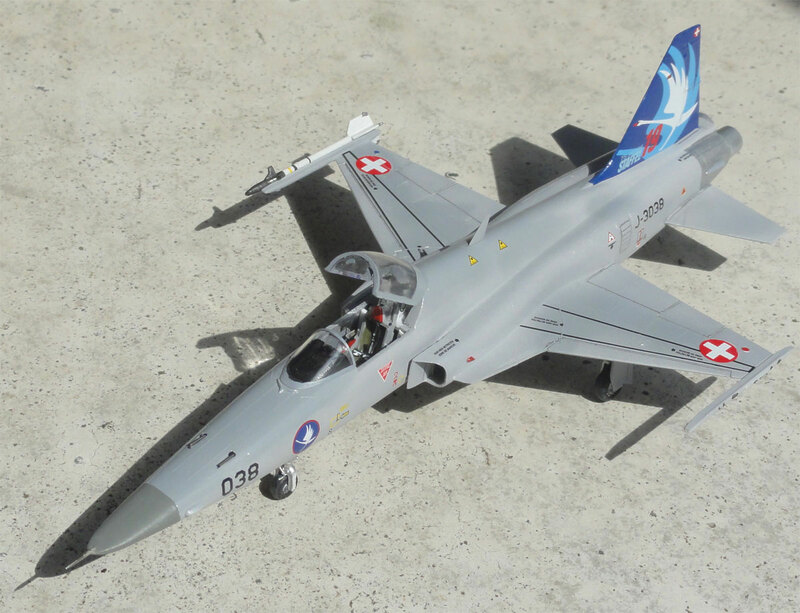 A local fighter aircraft as the FFA P-16 was also manufactured but never ordered, a few Mirage III fighters were purchased but with large budget overruns. In the Seventies a modernization took place. Northrop F-5E Tigers were purchased under the "Peace Alps" program. 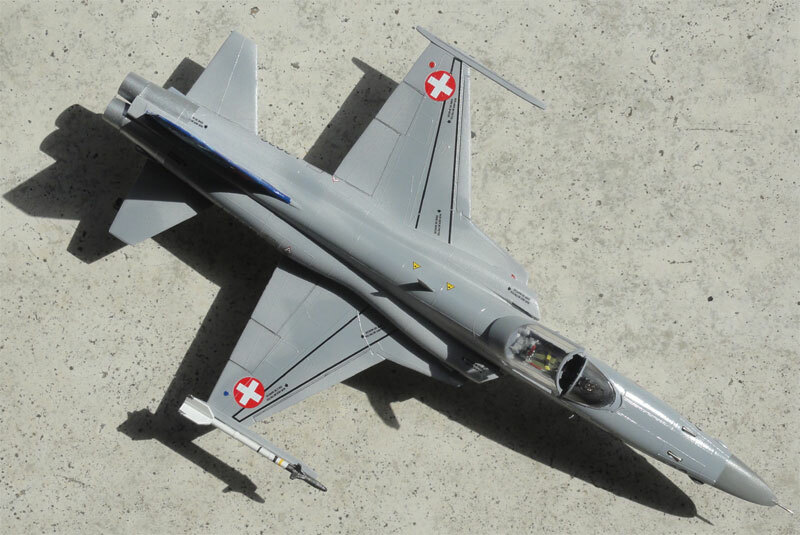 In 1978, the first of 13 F-5E and 6 F-5F arrived manufactured at Northrop but Swiss FFA license made the remaining aircraft. 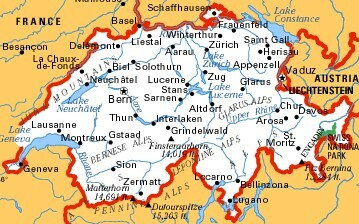 The Swiss air force eventually operated some 98 F-5E and 12 F-5F aircraft. The older Vampires did not retire until 1990, long being obsolete and the last Swiss Hawker Hunter flew in 1994. 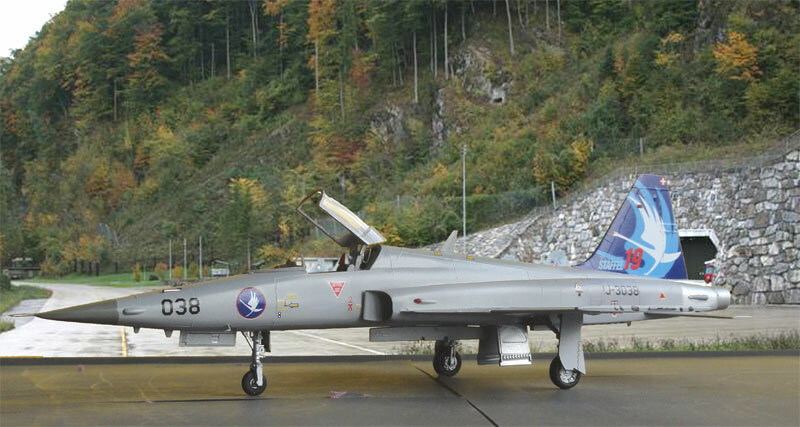 The F-5 Tigers flew from Dubendorf and Payerne, often flown by reservists pilots. Local bases often situated in mountains in war time are also available. 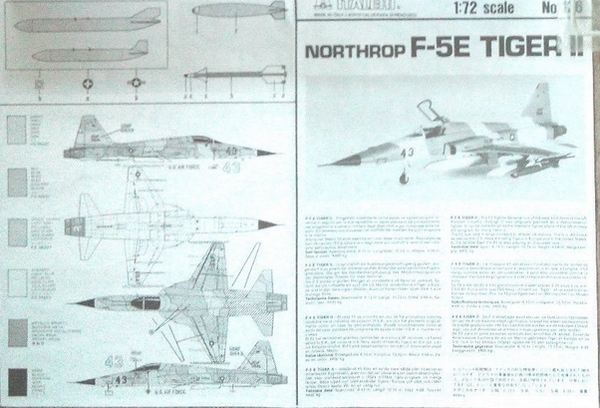 In the nineties, 34 Northrop/Boeing FA-18C/D aircraft were ordered and made under license. The F-5E still serves as fighter while the FA-18C acts as multirole aircraft. Here it is well seen that the "platipus shaped" nose. In a landscape at Meiringen base, with a tunnel entrance to a mountain shelter.